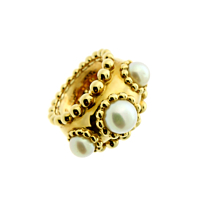 Here's a chance to own a fine estate piece from Chanel fitted with 3 stunning Pearls within its 18K Yellow Gold housing. This ring is a unique piece that is perfect for any occasion, day or night. The ring is in excellent condition and we don't expect this piece to stay in our shop for long.